A group of scientists led by Geoffrey Collins of Wheaton College has produced the first global geologic map of Ganymede, Jupiter’s seventh moon. The map combines the best images obtained during flybys conducted by NASA’s Voyager 1 and 2 spacecraft (1979) and Galileo orbiter (1995 to 2003) and is now published by the U. S. Geological Survey as a global map. 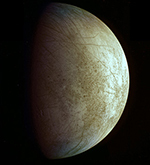 It technically illustrates the varied geologic character of Ganymede’s surface and is the first global, geologic map of this icy, outer-planet moon. The geologic map of Ganymede is available for download here.